A calf which has been born with just one massive eye is now reportedly being worshipped as a god in India, a report by The Sun UK has revealed. The deformed newborn, from the Bardhaman district of West Bengal, has one single large eye and no nose at all. A bizarre video appears to show it gasping for breath. Local sources claim it is being worshipped “as a God”. A source said: “Ever since the calf was born, the people have crowded to see it. They are now considering it to be a miracle of God and have started worshipping it. 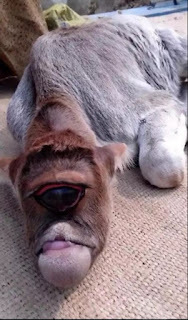 The calf actually suffers from cyclopia which is a rare congenital disorder that occurs in both humans and animals when a sole eye is located where the nose would normally be. It develops in the womb when the left and right hemispheres of the brain do not separate as they are meant to early in the pregnancy.